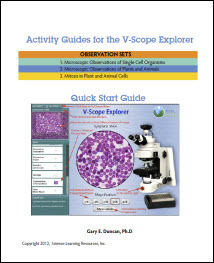 The Multicellular Animals, Multicellular Plants, and Single Cell Organisms V-Scope Explorer™ slide sets have been updated to include references to the new activity guide. A link to this guide has been included in on every slide in the set. V-Scope Explorer™ Microscope is a is a simulated experience of using a real microscope. This simulation adds a new dimension to your lab experience and can supplement textbook and classroom sessions by learning through this virtual lab. The Multicellular Plants, Multicellular Animals, and Single Cell Organisms slide sets join the Anatomy and Physiology slides which are already available in the NCLOR.